With you this week, as with all those who will come to Taizé throughout this year, we would like to seek how to open new paths of hope, around us and in the world. It is true that we are in a world where many know despair. There are many reasons for this. There is violence, continuing wars, the recent attacks in Egypt and Sweden. This Holy Week allows us to follow the passion of Jesus day after day. He also experienced violence, even death on a cross. So where are we able to find a source of hope that never runs dry? Where to find this source if not in the tenderness of God? It is his very identity: God is love. Pope Francis is doing everything he can to make us more sensitive to this. The last two weeks I was in Rome and it was given to me to be received by the Pope. I was struck once again to see how much he is himself a witness to God’s mercy, attentive to every person, every situation. I would like to ask all of you to pray for him. If we remember Jesus’ death in these days, in the night from Saturday to Sunday we will celebrate his resurrection. This mystery is beyond us but we sense that he is a source of new life beyond violence and death. Henceforth, it is possible for each and every one to affirm: the risen Christ is close to you forever, he loves you as you are. Of course his presence does not set us on an easy path devoid of all demands. On the contrary, welcoming the love of God encourages us to respond to the demands of the Gospel knowing that the goodness of God will have the last word. It is this trust in the love of God that will enable our brother Jean-Daniel, on Sunday morning, to say to Christ a yes forever, committing himself for his whole life in our community. He comes from Slovakia, he has lived with us for five years, he has long prepared himself to follow Christ. His family will arrive tomorrow to be present at this beautiful event. Welcoming God’s love opens us up to the beauty of life: tasting beauty through nature, art, a human gaze, preserving moments of gratuitousness. Without that our life dries up. And that with the little we have. Yes, with very little, with almost nothing, we can approach those who feel excluded, who are abandoned at the side of our roads. And we will make this discovery: the poor have something to say, it is not only a matter of helping them but of listening to them and receiving from them. Often the most disadvantaged help us to accept our own weaknesses. And even more: they can help us to enter into greater intimacy with Jesus who was poor among the poor. We can serve Jesus in them. In this context, I cannot avoid speaking of the hospitality offered to migrants. Europeans may build in vain all kinds of walls, migrants will enter our continent anyway. Expressions of concern will not discourage those who are experiencing situations of intolerable distress from leaving their countries. Of course, the arrival of so many refugees in Europe poses complex questions and no one has easy solutions. But I am convinced that we will not find any solutions without personal contacts. Without such contacts, fear, which is understandable, risks taking over. Through such contacts a spirit of fraternity can emerge. 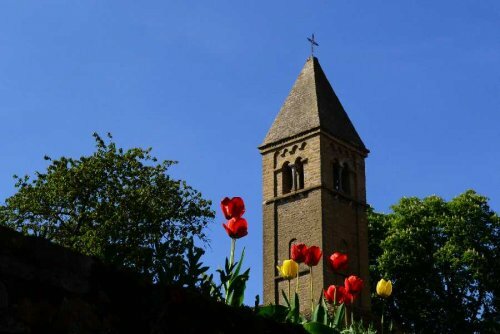 In Taizé we have welcomed two Christian families from Iraq and a Syrian Muslim family, as well as two groups of young men from Sudan, Eritrea and Afghanistan. I keep telling them: God sent you to us. And today our hearts are particularly close to the 1,600 refugees who lived in the camp of Grande Synthe, near Dunkerque, in the north of France. This camp has just been destroyed by a fire and hundreds of people are homeless. We pray tonight for them all. I must finish. Today, the tensions and upheavals of our societies are such that we must make a strong inner decision not to yield to discouragement but to open paths of hope. What decision? It means plunging our roots deeper into the Good News of the Gospel. Faith, trust in God, cannot be a marginal reality for us. It means nothing less than putting Christ once again at the center of our life. What a beautiful project for this Holy Week, on the way to Easter! In order to strengthen our trust, let’s dare to believe in the Holy Spirit. Let us lean on him, although he is invisible. He is present in our hearts and in the world.